You may not have heard of Ta Phrom before but many of you must have seen it. Featured in the film, Tomb Raider, it was here that Angelina Jolie was directed by the little girl to the jasmine plant before she fell down the hole into the temple. You will also recognize this place in the many publications on Angkor as often, the most published photograph of Angkor is that of Ta Phrom. The mystery that Ta Promh is does not fail to draw me back each time I visit Angkor. 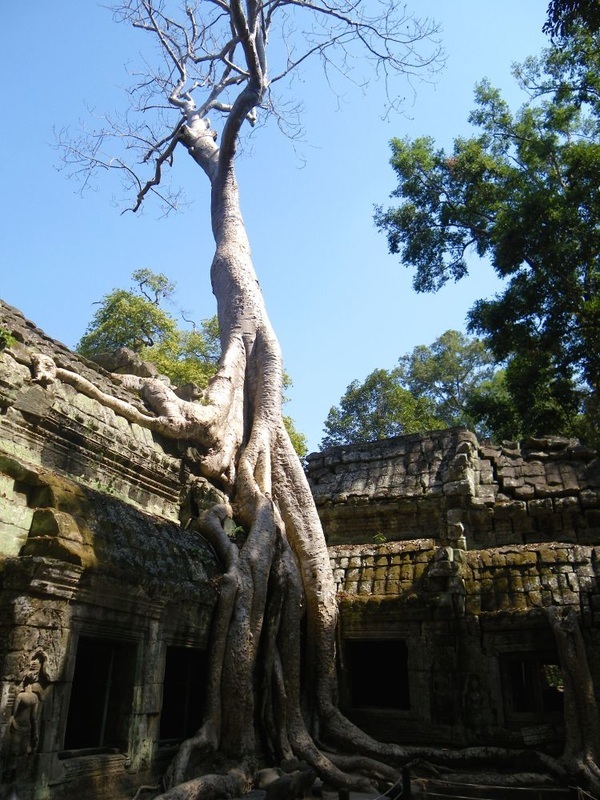 The roots of ancient trees engulfing the temples seem to protect these from the incursions of modernity. They seem to protect the temples from outsiders’ touch as if these are too sacred and have to be seen only from a distance with awe and reverence. In the early morning, when the temple is still free of bustling tourist groups and the morning sun shines through some of the curtains the trees have opened up, the temple engulfs one in its mystery. There is stillness and communion with the ancient past that must have been full of life and vibrancy at its peak. In my memory, after several visits to Angkor, Ta Phrom occupies a prominent place. 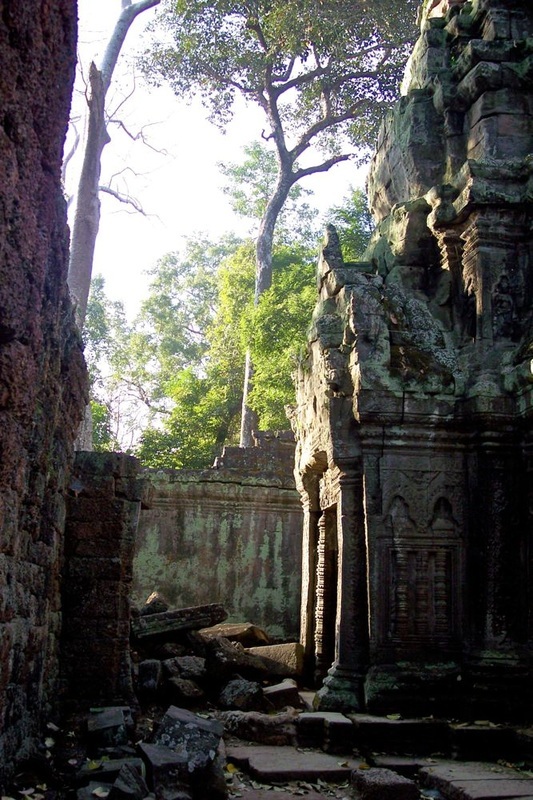 In fact, when I think of Angkor, the image that comes to mind is that of Ta Phrom. Somehow, it is the image of memory in itself, with roots growing around the temples engulfing these in its embrace creating its distance from any onlooker. What a magnificent picture of memory…ancient roots and ruins embellishing each other and creating a striking representation of the far distant past that was full of power and beauty. I can never have enough of this picture that I often return after dragging myself away to have a peek at the other far bigger and resplendent temples in Angkor. It is good that this temple was left mostly the way they found it. Some work had been done to keep it safe and the influx of tourists have left its own destruction but all these years nature has made its own claim as well and it is winning. The best time to visit is in the morning right when Angkor opens its doors to welcome visitors. Wait until the sun slowly creeps through the ruins and the ancient silk cotton and strangler fig trees that have engulfed the temples and think of the time when it was home to 12,640 people with around 79,365 in villages close by providing them food and supplies. The temple covers barely 2.5 acres but its walls and moat encompassing 148 acres must have sheltered villages attached to the temple. The outer wall of 1000 by 650 meters (650,000square meters), now left to nature, must have been a major town. It is said that the temple at its peak had enormous wealth controlling around 3000 villages, thousands of support staff and vast stores of gold and precious stones. Walk around the five rectangular enclosing walls before exploring the central sanctuary. There are gopuras or gates marking the entrances at each of the enclosing walls. Added to these gopuras are the face towers some of which have collapsed over time. The three inner enclosures of the temple proper were galleried. The corner towers of the first enclosure form a quincunx with the tower of the central sanctuary. As access today is limited and with later additions to the temple, you will find it a bit confusing to follow the temple map. Worth exploring though are the libraries in the southeast corners of the first and third enclosures, the Hall of Dancers (at the temple’s peak, there are about 650 dancers) between the third and fourth eastern gopuras and a House of Fire east of the fourth eastern gopura. 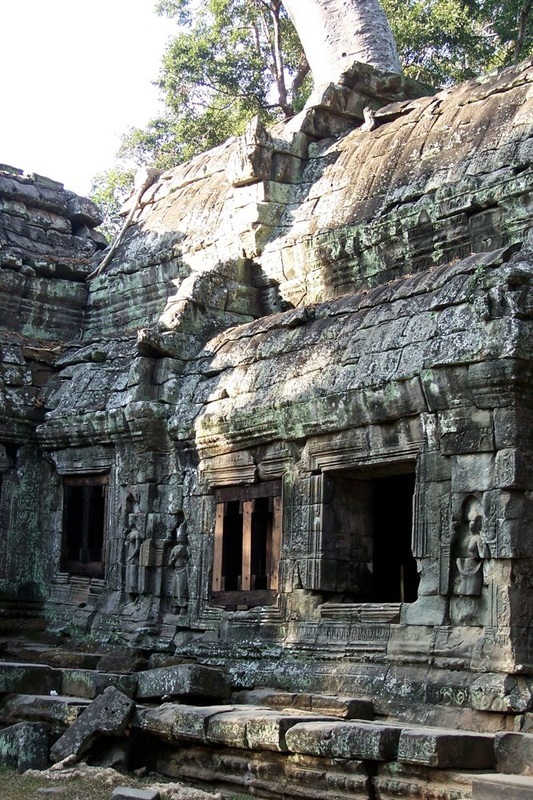 Ta Prohm is one of Jayavarman VII’s first major temple projects. Dedicated to his mother, it was originally constructed as a Buddhist monastery, it houses the deity Prajnaparamita, the "perfection of wisdom." Consecrated in 1186, the Prajnaparamita statue was surrunded by 260 lesser divinities, housed in their own sanctuaries. Other than this, Ta Phrom has few narrative bas-reliefs. Some depictions from Buddhist mythology, one of which illustrating the "Great Departure" of Siddharta, the future Buddha, from his father's palace remain. There are other stone reliefs of minor female deities (devatas) monks in meditation and dvarapalas (temple guardians). As Jayavarman got involved in a frenetic construction of other major monuments, his projects were mostly done in haste and, as such, the distinctive Bayon- style of this period is recognized in the giant stone faces, cruder carving techniques, and lintel carvings with little or no flourish. As Jayavarman also dedicated his kingdom to Mahayana Buddhism, the period shows Buddhist themes to the carvings which were removed and destroyed in the later period of Jayavarman VIII. Signs of these are still apparent in the chipped out images of Buddha or crudely transformed, in some cases, into lingas and Boddhisattvas. 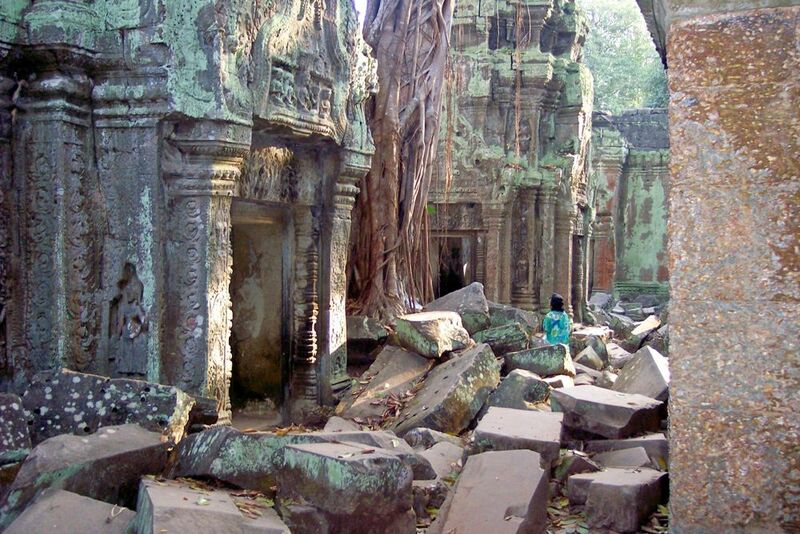 You will find good examples of these altered images in Ta Prohm. Though not the key temple in the Angkor complex, Ta Prohm has become one of the favorites due largely to the temple having been left closer to how it was when it was first discovered. Nature has almost taken over and because of this, somehow, the temple has acquired an ancient majesty that challenges the imagination. As if, the temples are hiding something that awaits to be discovered, that entices one to explore and look in the hope of seeing surprises from the ancient past. 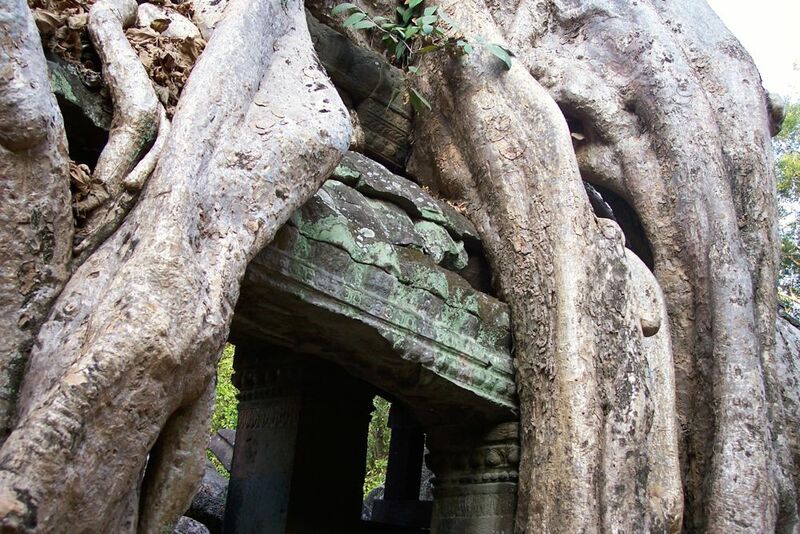 ​And yet, with the roots hugging the temples in protective embraces, they seem to caution you from getting too close. You can only look and in awe somehow surrender. 1. A hat, sunglasses, and sunscreen to protect yourself from the intense sun. 2. Dress appropriately for warm humid and sunny visit to a temple. Light, airy cover for your exposed skin. A local scarf called kroma is useful. Get yourself one when you arrive. It is very cheap. 3. Mosquito repellant when you plan to see the Angkor sunrise and sunset. 4. Shoes for walking and climbing uneven surfaces. 5. The temples are far apart so transport is necessary. 6. Visit early in the morning, as soon as it opens and go back to have a swim in your hotel before noon. Come back again the afternoon when the sun is no longer that strong. 8. A guide would really be useful. 9. Water, though you can also buy this in the area. 10. Pace your visit of the different temples so as not to have temple burn-out.